Everyone has experienced it: While going through airport security, the TSA agent opens a bag and tosses out someone's favorite hair conditioner, sunscreen, or raspberry jam because it is over the three-ounce limit for liquids. While these security measures are necessary for safety, what if there was a way to test the liquid to determine whether the contents are safe to allow on airplanes? ECE ILLINOIS researchers are developing a wireless-based technology that may be able to do just that. 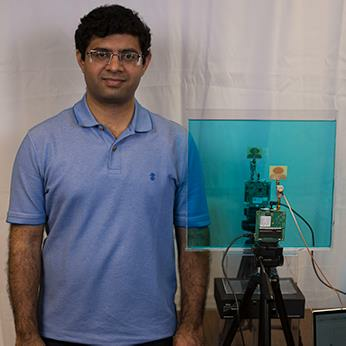 ECE ILLINOIS graduate student Ashutosh Makrand Dhekne is working with ECE ILLINOIS Professor Romit Roy Choudhury, ECE Assistant Professor Haitham Al-Hassanieh, and other students to develop this technology, which TSA agents could use, for example, to analyze the content without spilling it or holding up the line. In order to determine what the liquid is, Dhekne uses the same refractive index jewelers use to evaluate diamonds. A gem’s authenticity is determined by shining a light through it and then observing the extent of the light’s bending within the stone. Of course, light cannot be used to see through opaque liquids or containers, and that is where the wireless signals come in handy. Wireless signals travel through air at the speed of light, or 300 million meters per second. But when they travel through a material, such as a liquid, they slow down. Measuring this slowdown helps identify the liquid. Currently the group has been able to differentiate between a variety of liquids including tap water/distilled water, Pepsi/Coca-Cola, skim milk/two percent milk, green tea/sweet tea, and many different oils. Dhekne further explains this concept in this new video. In addition to the impact that liquid detection could have on airport security, it also has the potential for improving food safety, assisting precision agriculture, and performing medical diagnosis. In many developing countries, for example, contaminated tap water is sold in the guise of mineral water inside bottles. The goal is that eventually, the Illinois-developed technology would be able to easily detect such deceit. In the fast-food industry, frying oil is often reused until a predetermined amount of time has passed or until it is visibly rancid. On busy days, the oil could go bad much quicker. Using this technology developed by Dhekne and his team, a worker could send a wireless signal through the oil and know if it is still usable, without needing to touch or collect sample from the boiling oil. In the agriculture industry, farmers often struggle with knowing how much moisture is in their fields. Taking soil samples throughout hundreds of acres for accurate measurements is time consuming and costly. Using this technology to scan the soils could be a huge time and money saver. “We have just scratched the surface and much remains to be done, both in terms of improving the sensing techniques as well as its applications,” said Choudhury. Moving forward, the team would like to improve the technology to make it able to even more sensitive to a liquid’s chemistry. These changes would allow doctors to diagnose anemia by sending wireless signals through blood samples and measuring the refractive index. It would alsoa facilitate non-invasive detection of fluids in or around a patient’s lungs. This potential life-improving if not life-changing research is already receiving recognition. The research and the results the group has already seen, were presented at MobiSys 2018, in Munich, Germany. Check out the original article on the CSL site.